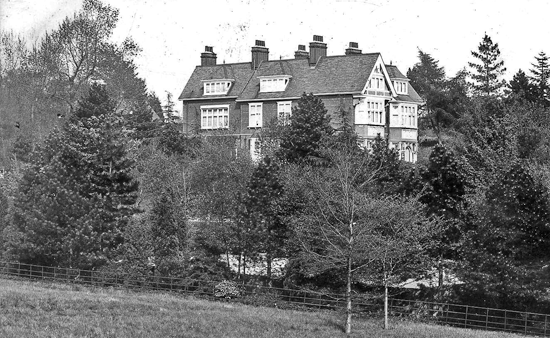 The Gorse (originally called Ee-Yuan) was built in the early 1880s. It is situated in Manor Park, Chislehurst, at the furthest point from the main road. It abuts an area of the National Trust woodland known as ‘The Gorse’ from which it may have taken its name. In 1900 Arthur Frederick White took ownership of the house. 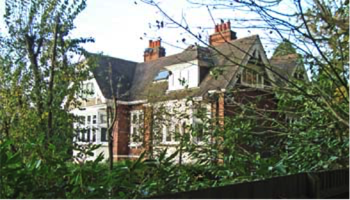 Early in World War I Mrs Arthur White, of Cookham Dene, Manor Park, offered The Gorse, which had been empty for 6 years, to the War Refugee Sub-Committee and it was used as home for Belgian refugees. 25 persons aged from 12 months to 83 years were housed there In November 1914. Articles in the Chislehurst and Sidcup District Times comment on the comfort of the house and gifts of food, coal, and clothing, and money donations. Some promised monthly subscriptions. Refugees came from Ostend, Malines (between Antwerp and Brussels), and Antwerp. They included a pilot, cigar maker, pensioned police officer, and a factory manager. Classes were held for learning English, and other classes knitted comforts for the soldiers. There were specific visiting times and days listed in the newspaper and further gifts in kind and money was requested. On 6th January 1915 a concert was held at Chislehurst Village Hall for the refugees from The Gorse and patients from Red Cross hospitals in the area. The Gorse Auxiliary Hospital opened in July 1916, when Holbrook Auxiliary Hospital, Holbrook Lane, Chislehurst, had to be returned to its owners. These houses were part of Kent/66 Voluntary Aid Detachment. On 25th September 1918 The Gorse closed, probably due to refurbishment. Sophie Tiark, who lived at Foxbury in Kemnal Road Chislehurst, was appointed Commandant of The Gorse on 30 September 1918. She was 38 years old and had been working with the wounded in Holbrook Auxiliary Hospital and Hornbrook Auxiliary Hospital since October 1914. Her appointment at The Gorse was celebrated with a dinner at the Bull’s Head, Chislehurst on 3rd October. Her mother, Agnes, visited The Gorse on 31 October 1918 after the refit and wrote ’To the Gorse Hospital with Sophie – so bright and well prepared for the reopening tomorrow’. During World War II The Gorse was used as a convalescent home and possibly a hostel for Polish refugees. After the war Bromley Council opened it as a home for children in care, whose Mothers were in hospital, and this lasted until the early 1980s. The house was derelict for some years but in 1990 was refurbished and converted into four apartments. Its Coach House is a separate dwelling. It is a locally listed building.